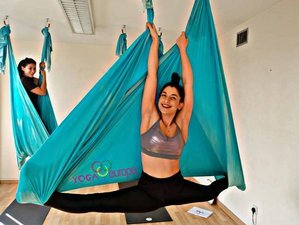 Yoga Europe School® invites you to join this unique Aerial Yoga Teacher Training held in Nicosia, Cyprus. The course is designed to give you a transformational experience. You will gain a deeper understanding of yoga and become a member of a like-minded international community of yoga teachers, schools, and advocates passionate about yoga. For those who want to teach, this will mark the beginning of a successful career as a yoga teacher. Yoga Europe is certified and approved by Yoga Alliance USA, Yoga Alliance Professionals (UK) and the World Yoga Alliance (India). Join the course to learn the proper foundation to teach Aerial Yoga safely, confidently, and with proper knowledge. During your training, you will be accommodated at Asty Hotel. Asty Hotel offers the best value you can find in Nicosia. Free Wi-Fi, free shuttle service, free bicycle rent, 24/7 complimentary beverages and snacks, cooked to order and buffet breakfast, spacious comfortable rooms with television, and coffee facilities and the most welcoming stay in the city! “Everything was great”, “kind and helpful”, “value for money”, and “best hotel in Cyprus”, are examples of comments hotel’s guests wrote about the hotel on sites like booking.com and Trip Advisor, from which Asty Hotel Nicosia has received awards. Located in the residential area of Agios Dometios (adjacent to Engomi), where many embassies are based, this comfortable budget accommodation of Nicosia offers five-star facilities. Asty Hotel, a family-owned business, you arrive as a guest and live as one of them! And all of this in a picturesque residential area, only 1.7 kilometers away from the city center, Yoga Europe School, and the maddening crowds! The hotel is perfectly located in a quiet area of the business district of Nicosia, right in the center of everything, government offices, ministries, embassies, and banking institutions. The hotel is also within five minutes’ walk from Nicosia Archaeological Museum, migration office, hospitals, the house of parliament, and many more sites of interest in Nicosia. The hotel offers free Wi-Fi in public areas, verandas, and all the rooms. They also offer free of charge assistance and printing services to hotel’s guests. Aerial Yoga Teacher Training organized by Yoga Europe School, based in Nicosia- Cyprus, being the subsidiary of WYA Organization in India. Aerial yoga is a combination of the traditional Hatha yoga asanas, aerial flow, and fitness dynamics. This combination, apart from offering well-being, helps you overcome your fears of being upside down, the fear of anti-gravitation, and floating. Practicing Aerial yoga is sort of a game which challenges and invigorates. It opens new doors as to how you can work with your own body weight. Using a hammock as a tool in supporting the weight of the body, you will learn how to enter, perform and exit yoga asanas, yoga asanas variations, strength, and flexibility enhancement poses, floating, flying, and inverted poses. You will learn the pros and cons of Aerial yoga, its history, how to flip and swing, and how to sequence a class. Upon completion of the program, a written and practical examination will be carried out. The Teacher Training Aerial Yoga program is certified by World Yoga Alliance India in the category of “Continuous Education” and is worldwide accredited. This yoga teacher training will take place in Nicosia, Cyprus. Nicosia (Greek: Λευκωσία) is the largest city on the island of Cyprus. It is located near the center of the Mesaoria plain, on the banks of the River Pedieos. Nicosia is the capital and seat of government of the Republic of Cyprus, and as such is the farthest southeast of all European Union member states' capitals. Yoga Europe School’s address is 3rd floor 9 Stasandrou street, Nicosia, 1060. During this training, you will be served daily breakfast. A reservation requires a deposit of 31% of the total price.